Lily came to Perkins Road Pet Clinic just after Thanksgiving of 2014 after she was spotted in the bushes by a McDonald’s parking lot in Perry, Oklahoma. Victoria Gandy saved Lily’s life by bringing her to the clinic for supportive care after she noticed the kitten wasn’t walking very well and wasn’t eating or drinking. Lily was about three weeks of age, weighed only one-half of a pound, was very malnourished, had a temperature that was unreadable (due to hypothermia; lower than 93 degrees Fahrenheit), was hypoglycemic and was diagnosed with severe coccidiosis by our doctors. Coccidia are protozoans that infiltrate the lining of the intestines and cause vomiting and diarrhea due to the stress and damage that the body endures. In severe cases, many baby animals are unable to recover from a severe coccidia infection. While Lily was critical and in the hospital, Dr. Tillotson took her home for monitoring. Throughout her stay with Perkins Road Pet Clinic, Lily’s health began to improve. Her temperature was climbing closer to normal, and she was beginning to crawl around her cage and eat more food. Lily was released from Perkins Road Pet Clinic with ten single doses of Albon to finish fighting off the coccidia infection. How is Lily Doing Now? On the day that Lily was released from the hospital, a technician offered to adopt Lily. Several days later, Lily came to her new home and is doing very well now. She is a very happy and healthy baby who weighs approximately four pounds and enjoys her days playing and basking in the sun. Mr. and Mrs. Carroll rescued Azzie and before they got their new pet home, they noticed that she was having difficulty breathing. Concerned, the Carroll’s stopped by Perkins Road Pet Clinic to get Azzie a checkup with Dr. Tillotson. Dr. Tillotson examined Azzie and diagnosed her with a respiratory infection and Stomatitis (mouth Rot). 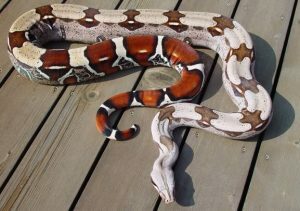 What is Stomatitis (Mouth Rot) in snakes? Infectious stomatitis usually occurs as a response to stress such as an inappropriately temperature-regulated environment, overcrowding, internal or external parasites, trauma, or especially poor nutrition. Vitamin C deficiency and inappropriate calcium/phosphorous levels in the diet have been implicated. Any of these stresses suppress the immune system of the reptile and make it much more susceptible to infections. Dr. Tillotson and PRPC staff gave an antibiotic shot plus sent home antibiotics to be given every three days for 30 days. The owners also flushed her mouth with a clorahexadine scrub at home to help keep the mouth clean and heal quicker. How is Azzie doing now? She is doing great! The carrolls’ said it was tremendous relief to know that their new pet was going to be okay. After her recovery Azzie participated in Petco’s reptile rally to the delight of all. “Kitty” Choike, a 2 year old Jack Russell Mix, was first seen at Perkins Road Pet Clinic when her owner, Joanna Choike, noticed that she was not acting like her normal self. She came in for drooling, coughing, and acting painful. Because of her history of chewing on and eating random objects, Dr. TIllotson recommended x-rays of her belly which revealed a sharp object in her stomach. Kitty’s owner opted to monitor her at home for a couple of days, and then x-rays were repeated. At that time, the same object was in her stomach and appeared to be a sewing needle. Surgery was recommended to remove the object, since she was at risk of perforating her gastrointestinal tract if the needle moved out of her stomach. She was taken to surgery, and a sewing needle was removed from her stomach along with some thread. Kitty stayed in the hospital for a couple days to recover from the surgery, and then recovered at home with her owner. Joanna has been taking extra precautions to make sure Kitty does not get access to any other strange objects that she can chew and swallow. Fortunately for Kitty, her owner’s attentive care and the successful surgery here at PRPC saved her from what could have been a painful and life-threatening gastrointestinal perforation. “I felt comfortable and confident that my closest friend would be safe here. Bringing Kitty here was the best decision I could have made. My baby Kitty is almost her normal self and that is so much for me to be thankful for.” – Joanna Choike. Bailey Brown brought Bentley to PRPC for Dr Tillotson to see as a second opinion when he began having seizures in July of 2014. At that time he was diagosed with Epilepsy and a tick borne disease called Ehrlichia. The tick disease can cause seizures due to inflammation of the blood vessels in and around the brain. Epilepsy, like in people, is a miswiring of the brain cells that can trigger seizures. Bentley was started on Phenobarbital for the seizures and Doxycycline (antibiotic) for the tick disease. He did well for a while. Bently then began having more frequent and violent seizures. He was referred to OSU for an MRI and spinal tap, which came back negative for any tumors or meningits. He was started on another seizure medication as well as continuing the Phenobarbital. A few months later he began having seizures again. His bloodwork came back normal and he was started on a third seizure medication called Potassium Bromide. Since then Bentley has been doing well and has routine check ups and only has seizures when he travels. Bentleys mom says he loves coming to visit everyone at Perkins Road, and that she will make the drive from Tulsa for him to come back for his check ups. She is thankful for the great care that Bentley received while he was with PRPC and for getting his seizures under control. Macy is a special dog who is well loved by her owner Mrs. Reeves. Macy has been a loving pet to Mrs. Reeves since she was 13yrs old. Even at 10 years old, she still acts like a playful puppy. First think Mrs. Reeves noticed was a change in Macy’s attitude from being sad, exhausted, and not being the playful dog she knew. It was an awful feeling when she saw Macy feeling miserable and felt helpless. Macy, just like many loving pets, has horrible allergies. After relocating back to the Stillwater area, she had an allergic reaction to the grass in the yard. Within a matter of days, Macy would pull out all of her hair and make herself sick from constant itching. Mrs. Reeves had been to Perkins Road Pet Clinic a few years ago, and noticed the staff was always so kind, loving, and eager to help. road to recovery. The Reeves family is thankful to the staff at PerkinsRoad Pet Clinic. Summer McVay acquired” Arya” a 6 week old Lab mix puppy from a friend after seeing that she had a deformed leg and knew she would need special attention. Summer fell in love with her from the get go and decided to make an appointment to have her leg examined. Arya was brought to PRPC to examin her right front leg that was shorter than the others. Upon exam the diagnosis by Dr. Katherine Gates confirmed that she did have a club foot. A splint was applied to help straighten the leg to see if she could evenetually us it. After several splint changes, the leg did straighten but was still too short. Sores began to develop as she tried to use it and became very painful and infected. Amputation of the leg was recommened to resolve any present or future problems. On November 12, 2015 Dr. Mellisa Tillotson performed “Arya’s” leg amputation. She recovered quickly from the procedure and went home after only 2 days of hospitalization. She is now a perfectly healthy puppy. The amputation didn’t slow her down a bit. Summer would like to thank all the staff at PRPC for the excellent care that was provided . She wanted to thank Britni for answering a lot of questions and Alex for always being patient and so very nice . She also would like to especially thank Dr. Tillotson for doing an amazing job on the amputation surgery and keeping her updated on “Arya’s daily improvement. Today Arya is a bouncing, playful puppy that seems happier than ever. In November 2013, while Vickey was out of town, her husband Dan noticed that “Gypsy”, their 11 year old pit bull was not acting normal. She did not seem like she felt good. Although she was still eating and drinking, she seemed lethargic and her hums were sticky. She was pale, was having a hard time getting up and seemed to be shaking a lot. Dan took “Gypsy” to Perkins Road Pet Clinic where bloodwork was done to make sure all of her organs were functioning properly and to make sure she did not have an infection. She was very painful during her exam and Dr. Tillotson suspected her spleen was enlarged. X-rays were done to get a view of all her organs and make sure there was nothing wrong internally that could cause her not to be feeling good. It was determined that “Gypsey” had hemangiosarcoma-a form of cancer. Hemangiosarcoma is an aggressive malignant tumor of blood vessel cells. These tumors start in the blood vessels and are filled with blood. When the blood filled tumor ruptures, it can cause problems with internal and external bleeding. Hemangiosarcoma usually appear in the skin, soft tissue, spleen or liver. They frequently spread to the brain, lungs, heart, kidneys, skeletal muscle and bone. “Gypsy” was given oral medications to help make her more comfortable and provide supportive care. Gypsy was brought into the vet clinic on a regular basis for bloodwork and medication. She was monitored to determine if the cancer was spreading and how quickly. Her medication was propberly monitored and adjusted as needed by the Veterinarian at Perkins Road Pet Clinic. Vickey and Dan both got to spend a lot of quality time with their baby girl. Unfortunately, Gypsy passed away from cancer in April 2015. 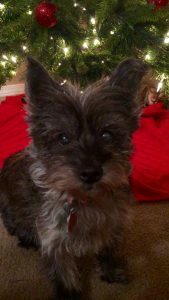 Thanks to the wonderful care she received from her loving owners, and the regular vet care given to monitor the cancer, her family was able to extend her life and enjoy her wonderful personality for a few nmore years than expected. Gypsy may be gone, but she will never be forgotten. In loving memory and forever in our heart, Gypsy Kline. Dakota Higgins has owned “Vinnie” for almost 6 yrears. He is a special part of his family. On November 1, 2015, Dakota left “Vinnie” in the backyard to play while he went to do some errands. When he came back home around 4:30PM, he noticed a huge gash on the top of Vinnie’s head. “I was devastated. It looked like the gash had broken his skull and what looked like his brain was showing” Dakota said. Unsure of what had happened to him, Dakota caled Perkins Road Pet clinic and rushed him to the clinic right away. When he arrived at PRPC, Dr. Tillotson examined Vinnie and it was determined that Vinnie needed emergency surgery to repair his skull. Once sedated, the staff cleaned the wound. Dr. Tillotson began surgery and pulled several bone shards out of the wound. The wound was flushed with a ssterile solution and his head was sutured back together. He stayed at the hospital for several days so he could be monitored for any lasting effects and his dad came every day to visit him. Head trauma should always be treated as an emergency. The skull is the main protection of the brain, and depending on how severe the trauma is, it could be life threatening. Head trauma can have many effects on dongs. It can cause them to go blind, have a head tilt, walk in circles, have seizures, and even death. How is Vinnie doing now? Vinnie is doing great now! 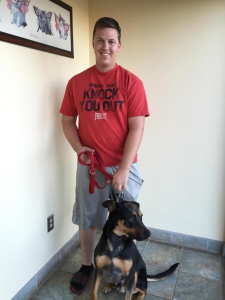 Dakota was very relieved when he was able to go home. “I am very pleased with the doctors and staff of Perkins Road Pet Clinic. They were very friendly and took great care of Vinnie”-Dakota. Thanks to Dakota’s fast actions of seeking medical attention for vinnie, he is back home and having fun. He has no lasting effects from this incident. He is truly a miracle and lucky to be here.